Villagers in northern India stalked and killed a tiger in a nature reserve just days after the state-sanctioned shooting of another big cat caused outrage and threats of legal action. 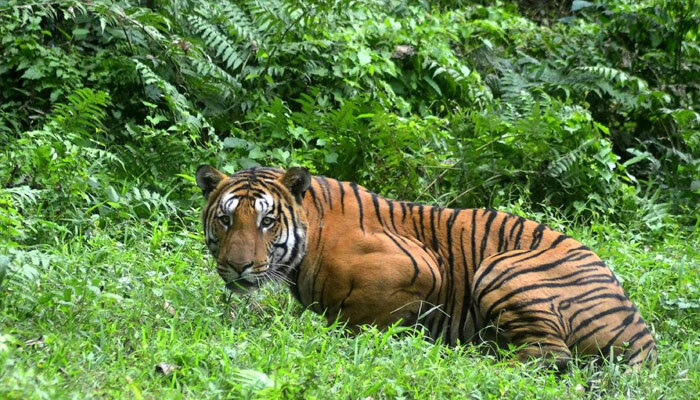 In the latest incident, a female tiger was beaten with sticks inside a protected forest by villagers who believed the big cat had attacked a local resident. "The tiger was killed after being attacked by irate locals," Mahavir Kaujangli, the deputy director of Dudhwa reserve in Uttar Pradesh state, told AFP Monday. "The body has been sent for postmortem examination and the report is awaited." The 10-year-old tiger was believed to have mauled a man who later died of his injuries, local media reported. It comes after another tiger was shot dead in the forests of western Maharashtra state on Friday night. The big cat was blamed for killing more than a dozen people and its shooting capped off one of India´s most high-profile tiger hunts in decades. The months-long pursuit had already proven controversial, with animal activists unhappy a celebrated hunter had been recruited to shoot the mother of two cubs. A member of Prime Minister Narendra Modi´s cabinet accused the state forest minister of acting illegally, and vowed to take legal action over the "ghastly murder" of the tiger. India established a national tiger authority in 2006 and bolstered anti-poaching laws to protect tiger numbers. Just 2,226 tigers were recorded in India, according to a 2014 census. Wildlife experts say human intrusions into tiger habitats, like roads and major construction projects, deprive the wild animals of the vast uninterrupted spaces they need to hunt. It also raises risks of tiger deaths through vehicle collisions, and other conflicts with humans. Dozens of tigers continue to die nevertheless every year in India. Nearly 40 were killed in 2017, according to the non-profit Wildlife Protection Society of India.